Azul Beach Resort Riviera Cancun, by Karisma is introducing the Nickelodeon Experience, the final piece of the ultimate family vacation. Unwind with a greeting glass of champagne and cool towel as your kid indulges in a special smoothie. Next on your agenda is Character Breakfasts meet and greets, and even inviting SpongeBob SquarePants, Dora the Explorer or the Teenage Mutant Ninja Turtles to your birthday or special event. All that whilst you dip your toes into the soft white sand on one of their breathtaking beaches. Suites with heated Jacuzzis® for two, a lazy river and guaranteed family connecting suites highlight this new hotel. This Gourmet Inclusive®, 435-suite oasis especially caters to kids and teenagers, ensuring they have fun, while supporting parents so vacationing with children is easy and requires zero planning. It also includes adults-only and premium sections. Guests can enjoy beachfront gazebo massages and the Sky Weddings service inspires destination weddings. 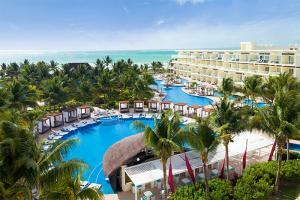 This Gourmet Inclusive®, 438-suite hotel is just 20 minutes from the airport in Cancun.